Adblock Plus and (a little) more: Clearing up some things from this week! There has been a lot of misinformation floating around these past few days about Adblock Plus, Acceptable Ads and the Acceptable Ads Platform, so let us try and clear up the most common misunderstandings. Will ABP make any money of its user base for allowing Acceptable Ads run on websites? Put that in your WTF. I’ve been using your addon until two days ago. Thanks for the nice trip but everything has to end. What you are now selling is screen real state that is “wasted” by the ads being blocked; your propose is to fill that wasted screen real state with the aproved ads of your own marketplace and in the process gain a healthy amount of money, which is not bad. As many I know that the Acceptable Ads initiative is many years old and that you can disable its ads but the backlash you received this week is one based on principles: you are becoming a provider of ads (or name it as you want). Finally, whitelisting is one thing and building a marketplace and a platform is a totally different one. Hey Leonardo! So as you have mentioned, we have been running Acceptable Ads for some years (5 years! ), and this is not really a change for the users. This is a tech-side improvement, in other words, instead of having to do things manually (https://adblockplus.org/acceptable-ads#application) we automatized the process of whitelisting. This helps to keep the web free in the long run and to encourage the creation of better ads. Cheers! Hey there! Let us know if you have any concerns and we’ll be happy to discuss :) Cheers! Can you clear up how it is ethical in any way for one of your employees to be both a filter list author for Easylist and for Acceptable Ads? What’s stopping this individual from blocking content in Easylist only to profit from the whitelist offered in Acceptable Ads? I fully support the Acceptable Ads Campaign, as many web sites need ad’s, and we can’t stand the modern ad overfeeding while Acceptable (or non-intrusive) ad’s will solve that issue. Sadly some websites still posting that ABP is selling ADS now. Someone should spread a word about this because most people easily believe what they read on the internet. Hey there! Yep, sadly there is a lot of misleading information about us all over the place. We’ve been trying to better communicate though :) Thanks! Acceptable Ads is a good initiative and not forced on anyone, these users who do not want to support content creator can turn off the whitelist feature in Adblock Plus and block all ads. That’s it: the user is in control! The goal is to have a better web for all. Have a nice week. Cheers! Hey again Jani! :) I’m not sure how precise is the translation to English, but I can tell by the headline that the info is misleading still, unfortunately. Anyone who believes anything that comes from those “tech” rags. I’ve got a Brooklyn bridge for sell! A Deja Vu douchebag attempt to defame ABP. It didn’t work in 2011, certainly fail in 2016. Edward Snowden stated, “It is your duty to use an ad blocker”. Hey Michael! haha exactly ;) we are having plenty of Deja vu here lately. Thanks for the support, we appreciate it. I think selling vacant ad space isn’t any better than just selling your own ads. As always, uBlock Origin is your (faster) friend! Hey Meme Man! We are not selling vacant space. We’ve been running Acceptable Ads for over 5 years already, and this is only a tech-side improvement. Nothing is changing for the user. That being said, the user can block ALL ads (by only clicking ONE button), or they can choose to let through Acceptable Ads and support their favorite websites. Let me know if you have any concerns and I’ll be happy to discuss them with you. Cheers! Awesome! :) thanks a lot for that. Let us know in case you need anything. Cheers! If you’re not selling ads how does ABP make money? Why are so many people I know and trust under the impression you are now selling ads this week? What specifically sparked this? Telling me nothing changed when everyone freaked out that stuff was changing is less than convincing if I do not know what they supposedly misinterpreted. So, I’d suggest you also read about our Acceptable Ads initiative (https://acceptableads.com/en/users), which we have been running for over 5 years already. This is only a tech-side improvement. So instead of having to do things manually (See: https://adblockplus.org/acceptable-ads#application), we automatized the process. This helps specially small publishers to finance content, to encourage the creation of better ads, and to keep the web free in the long run. The user is in control, just as before. Let me know if you have any other questions and I’ll be happy to clarify them. Cheers! I would like to argue that most people using ad blockers “don’t mind seeing non-intrusive ads”, as you keep repeating. You use this argument as an excuse to have “Acceptable Ads” default instead of as an option. Please provide impartial evidence that this is the case. I would say that most of the people using ad blockers do not want to see any ad whatsoever. Thus, as someone says above, you should give “Acceptable Ads” as an option and not as default if you want people to believe that you are not just an ad seller. Well, as we have mentioned in this post, the main reason we leave it as a default is because we think partial ad blocking is better than complete ad blocking. Let us know in case you have any questions. Cheers! I’ll still be able to whitelist sites, even if they’re not in the Acceptable Ads program, right? Acceptable Ads can still track me, and I care more about that than about what the ads look like. Why not block tracking software as part of the Acceptable Ads program. Answer 2: so if you don’t want to be tracked I would suggest you subscribe to the EasyPrivacy list and uncheck the “allow some non intrusive ads” feature. Thanks for the reply but you haven’t answered my question I’m afraid; if you are so confident that the majority of your users support the Acceptable Ads initiative, why not make blocking all ads the default and Acceptable Ads optional? The reason you don’t I suspect is that you’re banking on most of you user base installing Adblock+ and forgetting about it, never once going into the options, and leaving you able to claim most users support Acceptable Ads as most users are using it. Doing so is disingenuous to your user base and, quite frankly, insulting our intelligence, we know why people install Ad blocking software; to block ads! Well, as we have mentioned in this post, the main reason we leave it as a default is because we think partial ad blocking is better than complete ad blocking. If you don’t agree with that you can block ALL ads by only clicking one button. A few things, this maybe long so bear with me. When ( a lot of years ago, (2006-7)maybe) I was introduced to Wladmir’s adblock plus. It came as a wonderful amazing all spanning solution to ads that were super annoying, and the then problems with another adblocker (forgot what that was). So I personally started recommending firefox plus adblock plus to all friends and family. ofc back then other than easylist, easyprivacy and a couple of other ones had to be added manually. Still, I went through the motions and introduced abp to literally hundreds of people over time. it was my standard recommendation (being the one techie in a third world country back then, my rec carried weight). I also enthusiastically joined the easylist site at the time(forums.lanik.us for some reason I remember this clearly) and continuously browsed the web and made contributions to it. (reporting sites, trying to make filters etc). there was rick and the other regulars and it was fun and we felt we were contributing to the web personally and making it a better place. fast forward, the noscript debauche happened, and noscript author forcefully introduced filters into ABP. Our trust in noscript was betrayed. I removed noscript at the time. and stood firmly behind wladmir. rick passed away,(not sure if it was before or after the noscript incident) (again forgive my bad memory, its been a long time) and we mourned but pledged to make the internet a better place yet. after, the acceptable ads initiative happened. there was a massive survey before, and it was declared that the majority wanted to see okay ads(Google text ads were given as a HUGE reason here) and we went with it. I supported adblockplus. behind the scenes we knew abp was making money off it, but I understood that Wladmir and others needed to eat off of the massive workload. And personally I don’t care if you rip off google(they have way too much money to begin with ) and a few other big companies and since I also did not mind text ads. then there was a post about how abp was being sponsored by a company(there were talks first) and such(this was eyeo) (not sure if this was before or after the acceptable ads initiative) and I started becoming wary. the problem with all of this, is the people I introduced abp to, then introduced abp to other people who then did the same. except they don’t read at all. after all, who reads the EULA now? and then this happened. now you are making a marketplace for other websites to choose ads, making standards for said ads to be chosen and then doing it on your terms.And you are taking a CUT off said ads. we were promised No ads at first, then non intrusive text ads only later, and now its becoming “ads covered by a set of standards”. What’s gonna happen next? huh? do you really think every user who installs adblockplus even reads about acceptable ads or even knows about this change? NO. the problem is trust. we were betrayed. what started as a movement to make internet better is now sold out. I know you will not disable the acceptable ads initiative by default (since your entire revenue stream depends on it, which will go away the moment you take that decision), but from now on and henceforth, I am going to make an effort to go back to every person I recommended abp to remove it, and install an alternative that is still uncorrupted and clean. It may seem ironic , but I am even willing to make an effort to the extent to take out ads for people to remove abp and link to a page which has the entire story about how abp sold out. blogs, social networks and postings. if enough people on our side make an effort, we can start another movement that we created back then. disabling acceptable ads may seem like a solution but its only a bandaid because we don’t know what you guys will do next. there is no longer trust. you know that any firefox addon effects the entire browser(it can even interfere with other addons)(see noscript above) I no longer trust you with the same power for me and my friends and acquaintances. Hey there! We appreciate your support for all these years, but I’m surprised that if you went with the Acceptable Ads in the first place, why would the launch of the Acceptable Ads Platform be causing a complete distrust from your perspective? This is only a tech side improvement, in other words, instead of manually going through the whitelisting process (https://adblockplus.org/acceptable-ads#application), we made it easier (automated) for people to adhere to our Acceptable Ads initiative. And we have not changed anything in the way we monetize: https://adblockplus.org/en/about#monetization as you pointed out. 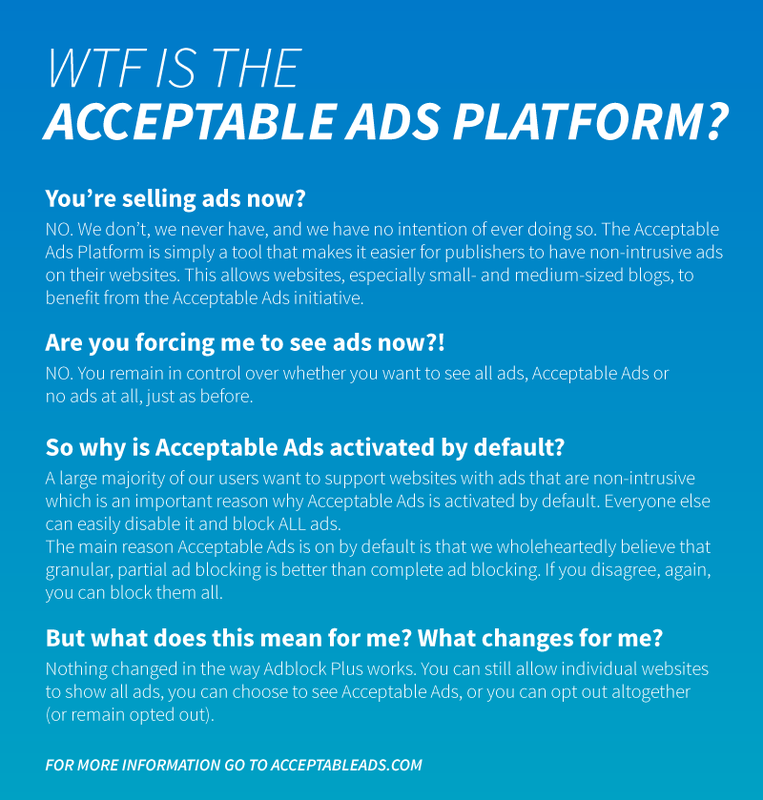 In addition, we announced last year the formation of an independent committee that will take control of the Acceptable Ads initiative: https://adblockplus.org/blog/from-the-manifesto-to-the-acceptable-ads-board This will make the whitelist more transparent and independent, thus making it scalable. I hope we can gain back your trust. We want to make the web a better place for all. We will welcome you back in case you change your mind. Cheers! I just love this spin which almost no one is buying anymore. Of course you are selling ads. You are the middleman in between adnetworks and the users. Even whitelisting companies like Google, Microsoft, Amazon and Yahoo made you a salesperson for their banners. Some of these comments sound like winging, whining, IAB, – websites. Who decided to unleash the “Bleating Sheep Trolling squad”. Unchecking a simple box is now a Herculean task. Really! “Stop the press! ABP makes money”. Since 2011, didn’t anyone get the memo? No hoopla about surreptitious data collection by Google, Facebook, Microsoft. Converting the Internet into Orwellian dystopia Stasi net. Stockholm syndrome is alive and kicking. Routehero! Another Easylist conspiracy! Your nuttier than squirrel sh*t. Take some Prozac! ASP! Whinging and whining about ABP? The Coalition for “better” ads was announced in Cologne Germany. Created by Google and the IAB (ha ha). Trivia! IAB was created for tracking pop-up ads. Tracking users, “check”, retargeting, “check”, selling users profiles, “check”. Pushing belly fat ads you love, “check”. Same old sh*t. Sigh! The above is the issue you leave Acceptable Ads on as default because you believe it’s better than blocking all ads. This is what your company believes but your product is called “ADBLOCK Plus”, by leaving the Acceptable Ads on as default you’re now conning anyone that downloads and installs your product; they will think your product blocks ads, not that it only blocks some ads, ads they you think of as “acceptable. I suggest that you change the name of your product as it stand at the moment it’s sailing pretty close to trades description law here in the UK and, probably, the rest of the EU too. I actually agree with you that the name “Adblock Plus” is a poor name for what we do, but we began as a complete ad blocker. We didn’t change the name when we developed Acceptable Ads because of branding. Another point is that the Acceptable Ads criteria was based on a survey we did with our users. Furthermore, we announced last year the formation of an independent committee that will take control of the Acceptable Ads initiative. This will make the whitelist more transparent and independent. Feel free to ask me any other question. Cheers! Acceptable ads defaults has remained since 2011. 5 years later, “OMG! Acceptable ads is on!”. If you fail to check your settings, ignorance is yours, yours alone. > If you fail to check your settings, ignorance is yours, yours alone. So, that post is from 2009. We have to remember how much ABP has developed since then. It was built for tech-savvy folks. We're constantly making improvements towards making ABP easier to use. If you look at it now, it is a LOT more simple to manage compared to that time. We actually try to encourage people to go to settings and to customize what they want. Leonardo. Yes, “Tyranny Of The Default”. That does not relinquish the users responsibilities. Allowing acceptable ads to operate, users are agreeing to the parameters. If Acceptable ads were that bad, 100 million ABP users would have voted with their mouse clicks. 1. Could you cite your sources / publish your data to back this up? 2. If this is true, then what is the problem with giving users the choice at the point of install? 2/ Users have two choices, uncheck the acceptable ads box. Uninstall the app. Simple! 1/I was referring to ABP’s user base. Firefox, Chrome store numbers continue to grow. The “Gawker” click bait “news” reporting, has failed to dent ABP’s user base. 71.3 percent, voted for non intrusive ads, 2011. The ad-blocker that you had problems with was probably Adblock (note the lowercase b, not to be confused with Michael Gundlach’s Chrome extension from 2010 called AdBlock), the extension from which Adblock Plus was forked in 2006; Adblock was, to my understanding, the first ad-blocking browser modification, dating to the Mozilla Suite in 2000, when installation was much more difficult because of the lack of an extension system. The EasyList forum is still at lanik.us (and I too have never figured out what the domain name means). EasyList creator Rick Petnel (rick752) died in January 2009, and NoScript added a surreptitious ABP whitelist in April 2009. ABP is open-source under the GPLv3, so even if it pulls some funny business with Firefox (which it will have less power to do, as the old extension system is deprecated), it couldn’t hide it, and it couldn’t prevent a suitably motivated group from forking it into a less-corrupted extension (even if there weren’t an admittedly superior choice in uBlock Origin). 1. If you don’t want to see minimal ads, turn them off in the preferences. 2. If you don’t like that ABP makes money while providing a FREE product and helping to clean up the internet, then use another program or write your own. You call it selling ads, I call it a smart business plan. I just about cried tears of joy the first time I went to weather.com with ABP enabled, and you know you did too. Get with the program, folks. In other news, I just bought a washing machine that doesn’t wash clothes and a car that doesn’t drive. Very happy with all my decisions! 1. A major unaddressed issue for acceptable ads is PRIVACY. I reluctantly(!) would allow them but for privacy. ONLY contextual ads without cross-site tracking should be considered acceptable. Until that is the default, I’ll be removing ABP as soon as alternatives are available. 2. Very disingenuous arguments to make ads and privacy invasion the default. Like Msft and Google, do some good, hide behind marketing doublespeak (opt-in defaults; “do not track” = “track but hide”; etc. ), get paid a lot. Yes, partially resurrecting an old 2011 argument, but ABP absolute sold out with their policies for defaults and tracking. Thanks for telling us about it! I really didn’t know what acceptable adds are and what is this “selling” ads… Someone should tell people that things read on internet aren’t always true. Still like your addon and thanks for the post. Keep up good work! hey there! You are very welcome. Let’s say there is room for improvement in how we communicate :) But thanks for understanding, and for the support. Cheers! If acceptable ads were running on my computer for five years. I’ve clearly failed to see those static acceptable ads, until someone informed me. I wouldn’t tell a dam soul! Certainly wouldn’t be cursing ABP on a public forum. Borderline idiocy! I’m not the rye observer of human folly, ignorance isn’t a defence. Especially if you don’t suffer from any eye impediments. Thanks for understanding and clarifying that Michael! We appreciate the support. Thanks for telling us about it! i’ll try to check our website for some unacceptable or spam-my ads. Thanks a lot. You are very welcome Leila! Let us know in case you have any question(s), and we’ll be happy to clarify. ABP is one of the best app. I’m using this app last 4 years. It’s awesome. Our team is really happy to hear that. Let us know in case you need anything :) Cheers!